I landed in Sheffield two weeks ago to perfect weather and an energy-boosting work meeting for UKClimbing.com. After the meeting we grabbed a couple of 3 star classic routes on the popular end of Stanage and, with a forearm pump that remained long after the rolling hills of the peak were behind me, I was off to the Lake District on a blue-sky forecast. I don’t know if I’ve ever seen Langdale as dry this early in the year, but the warm-brown mountain rock felt familiar under my skin, despite a fifteen year hiatus from the area, and it was with a real spring in my step that I, partnered by the effervescent and every-ready Max Cole, bounded up the familiar hillside to Gimmer Crag. The last time I’d climbed there had been a speedy solo of a classic E1; Gimmer String, as part of a running/climbing link-up that started on Raven Crag and took me round to Crinkle Crags, Bowfell, Neckband and finally for a pint in the ODG. That was 2002, and now almost fifteen years later the beauty of the fells and the warmth of the memories I had from my time in the area welled-up and so did I. 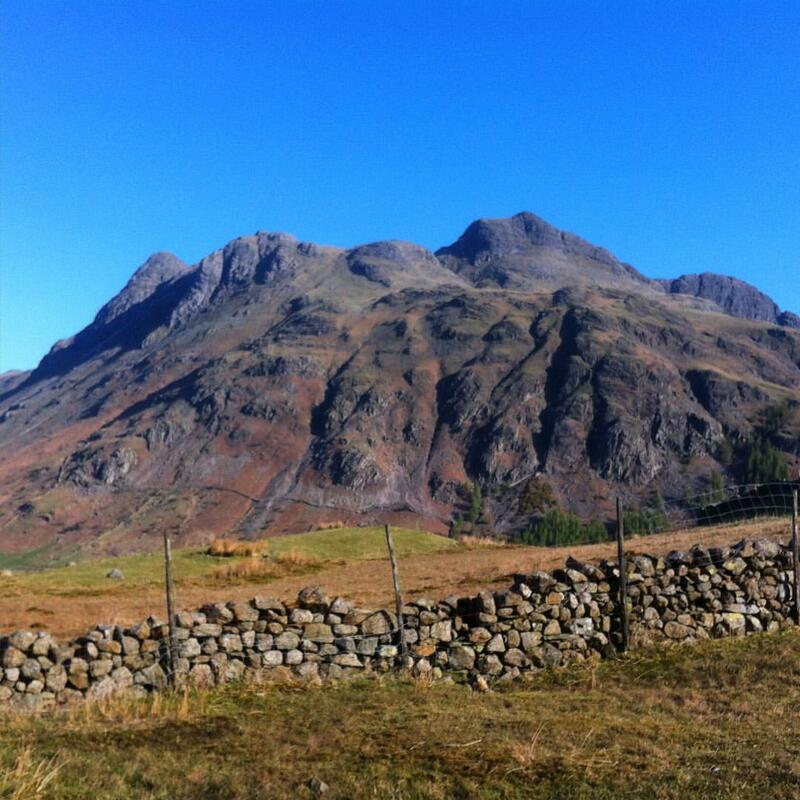 Stunning views and dry conditions in Langdale the week before the training course. Max and I climbed a few classic moderate routes up to E2, savouring the climbing and position, and the fact we could belay in T-shirts, but whilst loving the climbing (Max might have mentioned a couple of times that he ‘loves climbing’) we were both mindful of the British Mountain Guides’ training course we had lined up the following week, and as such our belay stances were well organised with speed and efficiency taking priority over hard grades. Gearing-up beneath the Ash Tree Slabs area and my mind wandered back to my first route on Gimmer, in 1998. I was working for the summer as an outdoor instructor at YMCA Lakeside, and on one of my days off I ventured on to what felt to be a big mountain crag, certainly bigger than the gritstone edges I had grown-up on. Young, fit and keen, we zig-zagged up the scree underneath the crag, following an illogical and loose line through the steep broken rocks, and finally landing, hot and sweaty, at the foot of the crag. The guidebook was perused and my two climbing partners for the day, two of my best friends; Juha and Pob, discussed which route we should tackle. Back to 2016 and I looked through the book for the route. Vaguely familiar buttresses jutted above me, memories of ledges and jugs, slings and smiles, but the features seemed vague, the location of the route out of my mind’s grasp. I was disappointed to find that the selected guidebook didn’t cover our 1998 first choice, but back then we didn’t look for the best routes, we probably just looked for a ‘hard’ one! Midnight Movie was graded E4 6b and we liked the description of a tough but well-protected route. The pitches sounded perfect too, a 5b starting pitch would be tackled by a young and inexperienced Pob. The short and hard crux pitch of 6b was to be Juha’s (8b+ climbing champion) lead, and I (also pretty young and inexperienced!) was to take the long, pumpy 6a pitch above. I don’t remember much of the ascent except the route was hard, and Pob’s ascent of the 5b was ‘shaky’ – on reaching his belay I quickly backed up his gear with my prized 0.5 flexible friend, but these were young innocent times, and safety wasn’t really at the forefront of our minds. Ah those endless summer days, where have they gone! Nearly twenty years later and the Guides’ course felt like a culmination of all those countless routes, countless hours on the crags and hills. A rusty start for all the Trainees, fumbling to get in the role-play of mock-guiding, and fumbling with gear, meant the first day felt tough, but as the week went on it was clear that many of the candidates had a lifetime of climbing behind them, and were ready to be trained to impart their knowledge on to others. 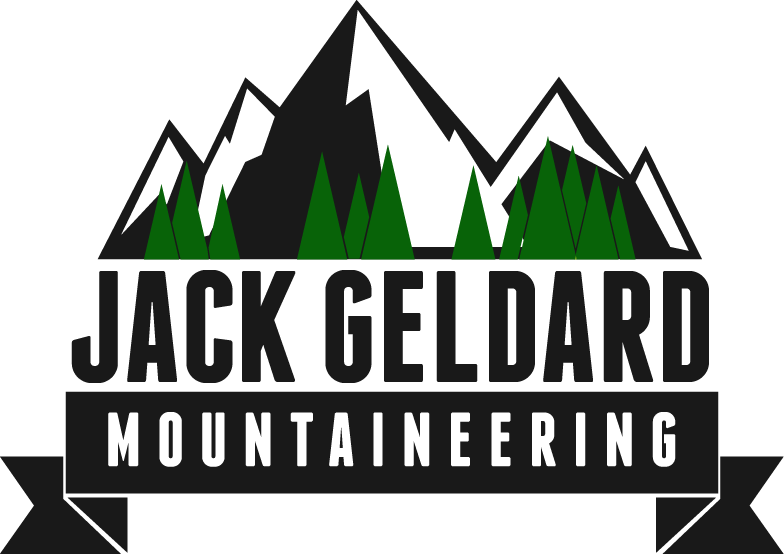 Our trainers were experienced mountain guides, two from the BMG (Stu McAleese and Adrian Nelhams) and as a super-star special guest we had Slovenian climbing legend Marko Prezelj. Not one to beat around the bush, Marko’s no-nonsense style of feedback left everyone clear with what they should do to improve as a guide and how seriously we need to take the qualification. Stu’s infectious enthusiasm and wealth of teaching experience meant easily digested demonstrations and tips on all aspects of UK summer guiding, and Adrian’s ultra-solid guiding and clear delivery brought everyone’s skills forward. For those wondering what these courses entail then instruction and practice of, and critical analysis of pitched climbing (up to E1), short-roping (on terrain up to Diff) teaching climbing, is all part of the course, and with training spilling in to the evenings it feels like a busy few days. 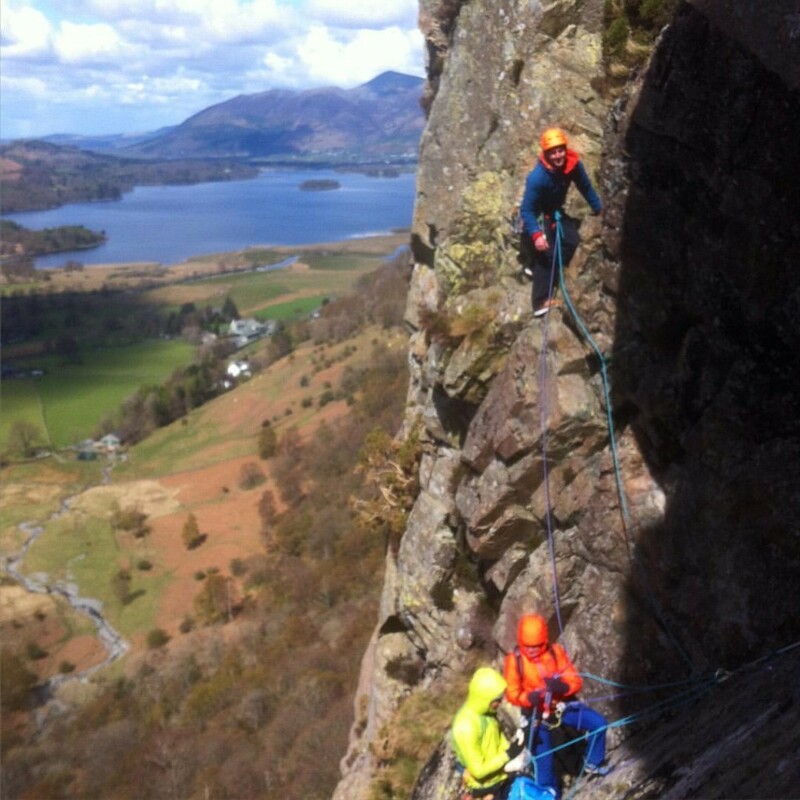 Ally Swinton in mock guide role on the Borrowdale classic Troutdale Pinnacle. The weather wasn’t quite the T-shirt kind that I’d had the previous week, with full on hail storms and snow storms peppering the days and adding to the atmosphere but not dampening the spirits. I’d popped in to the MarmotUK office just before the course to get togged up with new shell clothing and synthetic insulation, and on the final day of the course, scrambling our way up a snow-storm engulfed Middlefell Buttress, I had every scrap of clothing on that I had brought with me. Thanks Hugh and Steph – you never know what hand the UK weather is going to deal you! I was pleased to receive positive feedback at the end of the course, and went away on a high, from the course, the climbing and the camaraderie of the group. Massive thanks to Adrian, Stu and Marko and equally to the rest of the Trainees. Roll-on the next training course! Motivation – Why climb dangerous routes?